It's no secret I'm a huge fan of Diana Peterfreund's work. I discovered her Secret Society Girl series last year and, in what seemed like no time at all, it quickly became one of my very favorites. Tap & Gown--the concluding volume of the quartet--came out in May and it was a perfectly splendid end to a series I know I'm going to re-read over and over again. The problem was I went into a bit of mourning when it was over. What saved me was knowing a brand new Peterfreund book was coming out just three short months away. The first in a new series (and a YA one at that!). I let the knowledge of the rather wonderfully titled Rampant carry me through as I said my goodbyes (for now) to Amy and the whole Eli gang. I always enjoy Diana Peterfreund's light touch with words. Her prose never feels heavy or disjointed and it's a pleasure letting your mind and eyes absorb the words as they come. 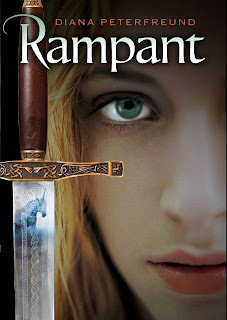 Rampant's strengths lie in its worldbuilding--the seamless way in which unicorn lore and legends come together to form the fabric of reality in Astrid's world. They are horrifying creatures and, when Astrid encounters the more nightmarish ones, the aftereffects include vomiting and agony. I absolutely loved how heinous they were. Along with that, the history of the hunters is layered and complex and extremely well done. I occasionally find myself tiring during exposition that covers thousands of years, wanting to get back to the action of the main plot. Not so here. The stories and bloodlines and incarnations were so varied and interesting that all I wanted was more. My reaction to Astrid herself was harder to peg. I think I was expecting her to be "different" from the very beginning, whereas all she wanted was to be normal. She spent a lot of time and energy toward that end, preferring to worry over whether or not the art major hottie likes her and not over which weapon to wield against poisonous, flesh-eating monsters. It's not that I blame her. In fact, in a book that is not short, I still found myself wishing for more time between Astrid and her fellow hunters-in-training, between Astrid and her hottie. Against the background of thousands of years, those sections felt brief. I understand why. I just wanted to get to know them all better so that I could care about them more fervently. Over time Astrid's training and abilities begin to change her in such a way that it's my opinion she'll never see this side of normal again. I, of course, take delight in that prospect and am looking forward to the sequel with much anticipation. Rampant is due out the 25th of this month. Sounds like fun! I can't remember if I ordered this with my last bunch from Amazon or not... I'll have to wait and find out, I guess. Ah, this is in my TBR. Got an ecopy from BEA. Looks good, must read faster so I can get to it faster! Juju, it's not your average YA fantasy novel. I think you'll enjoy it. Wendy, you definitely do! Start with SECRET SOCIETY GIRL and go from there. Each book gets better and better. I adore that series. I would have liked it to be longer too. Much looking forward to the sequel. I can't wait for this one which means I can only skim your post. I'm superstitious about hearing too much about it before I get to read it! Rhiannon, I understand completely. I'm going to be doing an interview and giveaway with Diana as we get closer to RAMPANT's release date so be sure to check back in for that! Alexa, I know! It's worth the wait--a really refreshing YA fantasy with a plot that's actually new and intriguing. The vomiting and agony sounds more than a little like Buffy's cramps in the movie version of Buffy The Vampire Slayer. Only less fun. Janus, there's more than a little Buffy in Astrid. And in the whole hunter training thing. I love it. This sounds good. I've been hearing about the sequel coming out so I'll have to read this first. What is the Secret Society Girl series about? Rachel, the sequel isn't out for a long, long time (I'm not done writing it). The first one isn't even out yet. Rachel, I should have specified. This is the first book and it is due out August 25th. I reviewed an ARC of the novel. And, as Diana herself said, she is working on the sequel now. Exciting! Gee, thanks, Angiegirl. You've done more damage to my tbr list with every post so far, and now you're making me add all of this author's books! Grrr. Darla, lol. Anytime! But I don't feel the least bit bad about this one. Her SECRET SOCIETY GIRL books are SO good. And RAMPANT is as well. Enjoy!